LOCATION.--Lat 39`52'43", long 76`51'13", York County, Hydrologic Unit 02050306, on right bank 15 ft downstream from abutments of dismantled county highway bridge on Township Route 452, 0.1 mi downstream from small left-bank tributary, 0.3 mi downstream from east boundary of Spring Grove, and 7.0 mi southwest of York. PERIOD OF RECORD.--May 1929 to September 1964, November 1965 to current year. October 1962 to September 1968, published as West Branch Codorus Creek at Spring Grove. GAGE.--Water-stage recorder and concrete control. 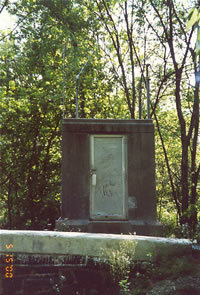 Datum of gage is 430.86 ft above National Geodetic Vertical Datum of 1929. Prior to Jan. 18, 1930, nonrecording gage, Jan. 18, 1930, to Sept. 9, 1941, water-stage recorder at site 0.9 mi upstream, and Sept. 10, 1941, to Sept. 30, 1964, water-stage recorder at site 0.8 mi upstream, all at datum 5.64 ft higher. Nov. 1 to Dec. 20, 1965, non-recording gage about 40 ft downstream at unknown datum, Dec. 21, 1965, to Mar. 31, 1966, non-recording gage at present site and datum. COOPERATION.--Monthly records of change in lake contents and daily diversion furnished by P.H. Gladfelter Company. Funding for the operation of this station is provided by the U.S. Army Corps of Engineers, Baltimore District.